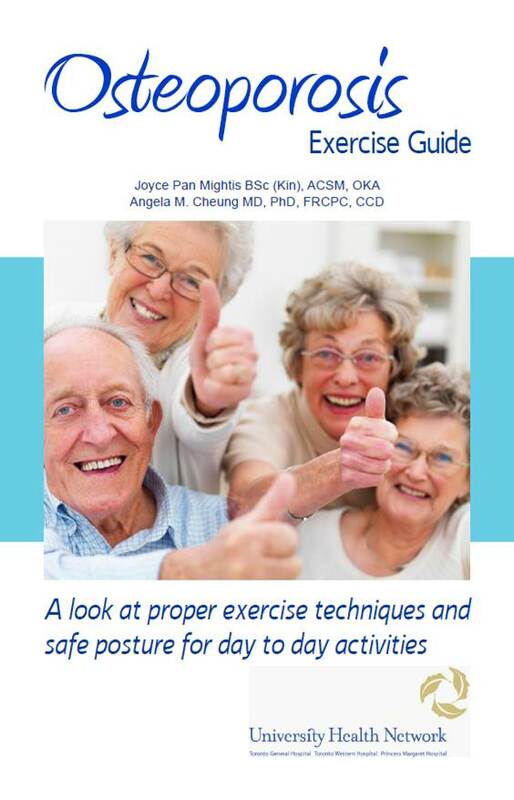 The Osteoporosis Program publishes a wide range of materials for the benefit of osteoporosis patients and the general public. Below is a list of our current publications. We will add more materials here as they become available. Too Fit to Fall or Fracture Handout. This handout provides easy exercises to do at home to improve bone health. Available in English and Chinese. Protein and Bone Health Handout. To maintain our bone and muscle mass, we need to eat enough protein everyday. This handout provides you with nutrition tips to help you achieve your daily protein needs. Calcium Assessment Tool. The Calcium Assessment Tool is used to measure how much calcium you are getting from your diet. Short Calcium Assessment Tool. This version of the Calcium Assessment Tool consists of the calcium calculation chart alone. Diet and Kidney Stone Prevention. This handout provides diet tips to help prevent calcium oxalate kidney stones. Are you at risk for osteoporosis & fractures? Take this quiz to find out if you should talk to your doctor about your risk of suffering from osteoporosis and fractures. Bone Health Nutrition for Vegans and Vegetarians. This brochure outlines nutrients that are important for bone health and need special attention in vegan and vegetarian diets. Managing Gout Through Diet. This brochure lists what types of food to avoid for patients with gout and how they can manage their illness through changes in diet. ADT Study Newsletter Issue 1 Volume 1 . Information for men with prostate cancer. ADT Study Newsletter Issue 2 Volume 1 . Information for men with prostate cancer. ADT Study Newsletter Issue 3 Volume 1 . Information for men with prostate cancer. Postmenopausal Health Overview. Postmenopausal Health Overview is our bi-annual newsletter for osteoporosis patients in our clinic and study participants.